After 39 weeks of being pregnant, I was physically, mentally and emotionally exhausted. A week before I had Hallie, I had gone in for my weekly checkup and was told I could be induced. After some thought I decided to stick it out and crossed my fingers that all the contractions I'd been having were a sign that I'd soon go into labor. After a week of trying almost everything to induce labor naturally I still hadn't gone into labor. At my 39 week checkup, an induction was brought up again. This time I didn't turn him down. I was shocked and giddy when he told me he'd see me the following morning at 7:30 and also warned me that I should plan on a long induction..10+ hours. I quickly made phone calls to family and friends letting them know the good news and came home and cleaned like a crazy lady. My mom showed up that night at 11:30 to watch Sage, and we stayed up talking until well past midnight. That night I didn't sleep as anticipation, fear and excitement surged through my body. At 6:30 I couldn't sleep any longer and decided to take a nice warm bath, make sure everything was packed and make sure everything was squared away for my mom to take care of Sage. We arrived on time late, (thanks honey), and got to the hospital a little after 7:30. I was quickly hooked up to monitors and had my IV in by 8:30. Contractions started getting pretty intense by 10:30 and I could no longer talk through them. I was dilated to a 5 and 90% effaced. I quickly questioned my desire to have a natural drug free labor. When I was informed that the anesthesiologist had just gone into surgery and wouldn't be back for another hour, I panicked and requested some form of pain medication. This is when Dilaudid entered my body. Oh Dilaudid, how I love you. I instantly felt dizzy, light headed and sleepy. For the next hour I dozed in and out of sleep, all while feeling every single contraction, but I just didn't care. That drug makes everything seem euphoric and like nothing matters in the world. At noon I received my epidural and was told that the doctor would be in shortly to break my water. At one he finally made his appearance and things got started. Fast. I was dilated to a 6, fully effaced and she still hadn't dropped into my pelvis. I was told that if she didn't drop, he would consider a c-section and that he'd be back in to check on my progress in 2 hours. Fifteen minutes later my nurse paged him to run. I had dilated from a 6 to a 10, she had dropped so low that she was almost crowning and I was feeling the urge to push. Dr. Cannon suited up, I held my legs back, made sure Quinn was by my side and we started pushing. After the first contraction I could see her head. After the second contraction, her head was out. By the third contraction, there she was. My sweet, precious Hallie girl. For nine months I had waited to see her face, hold her hand, smell her intoxicating baby scent. And here that moment was. I cried, I rubbed her tiny head, snuggled her close. I counted 10 fingers, 10 toes. 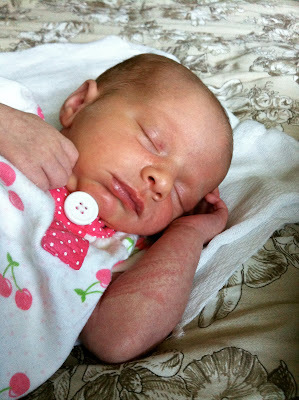 I couldn't get enough of the light soft curl of her hair, her delicate petite features and her tiny newborn cry. After sacrificing food, sleep, terrible hip, back, nerve and bone pain. She was here. The love I felt for her was instant. My heart was bursting at the seams for this tiny infant who I'd just barely met. My love for her was indescribable, unconditional and I knew in that moment that I was meant to be her mother, and she my daughter. It's been a whirlwind of emotions these past two weeks, but I can't consider my life anything other than perfect. She is adorable. I cant wait to see her. Aunt Heidi loves her Niki!!!!!! Oh da baby! More picta's please!